EnsnarePRO is a non-repellent residual suspension concentrate spray. It can be used in conjunction with baits without reducing the performance of the bait. Ants, cockroaches and flies don’t know it’s there. The ‘non-repellent’ properties of this formulation does not interfer with insects natural behaviour and allows for greater exposure (and thus uptake) to eradicate hard to control populations. EnsnarePRO is exceptional for the control of heavy cockroach infestations in commercial and other situations. At the heart of EnsnarePRO is the powerful active, indoxacarb which is bio-activated by the internal enzymes in target insects. The internal emzymes convert EnsnarePRO into and even more potent insecticide. The added advantage of this bio-active process is the slight delay in control ensures the target pest transfers EnsnarePRO to other insects thus providing enhanced population control. 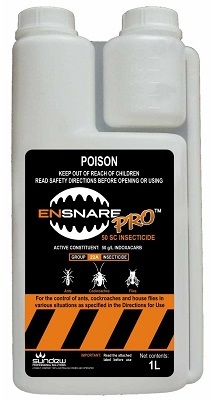 Extensive field trials by Sundew demonstrate that EnsnarePRO provides excellent control of cockroaches and ants and can be successfully used in conjunction with gel baits. When sprayed prior to application of Sundew BattleaxePRO Roach Bait Gel there is increased consumption of the gel bait.